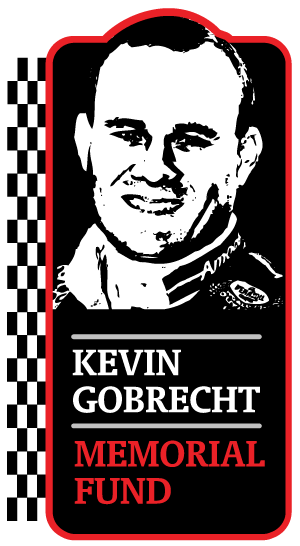 The KEVIN GOBRECHT MEMORIAL FUND (KGMF) is a 501c3 established in 2000 to honor the memory of Kevin Gobrecht. Gobrecht, sponsored by Amoco Oil and NASCAR’s Dave Blaney, lost his life at age 30 in 1999 while racing with the elite WOO series in Nebraska. A New Oxford native, his family established his memorial fund to honor education and Gobrecht’s love of racing. KGMF distributes $5,000 in scholarships annually, as well as donations to other charitable organizations. As of 2011, KGMF has donated more than $250,000 in scholarships, charitable giving, and memorial sponsorships. These contributions are not possible without the generosity of the racing community who support the Kevin Gobrecht Memorial Fund with donations, purchases of memorabilia, and ongoing support. The Gobrecht family extends their heartfelt thanks for your kindness and support, your friendships, and generosity throughout the years. If you would like to contact the Memorial Fund please click here.